As a family-owned and operated practice based in sunny San Diego County, we are dedicated to providing you with impeccable service from start to finish. From the moment you step through the door, you’ll have the undivided attention of a small team of professionals who are devoted to making you feel perfectly at home. Long story short: We put you first, 100% of the time. Dr. Yoo is currently the only surgeon in San Diego County to have completed a prestigious fellowship in Facial Plastic and Reconstructive Surgery at Stanford University under the expert guidance of Dr. Sam Most, a renowned specialist in plastic surgery of the head and neck. Dr. Yoo is passionate about what he does, and strives to ensure his clients feel seen and heard as individuals, so that they walk away overjoyed with the results. When he’s not busy rejuvenating his client’s good looks, this former college soccer player loves spending time with his wife, Amber, and his dog, Hayden, indulging in a game of ping pong or tennis, and researching the latest technology. IPL & Laser Practitioner - Kayla, M.S.N., R.N. Interested in restoring that youthful glow to your skin? Then you will have the pleasure of becoming Kayla’s patient as she is our resident expert on all things lasers! If you’ve been considering an IPL or laser treatment, Kayla is here to answer all of your questions. Once you two have decided on the best treatment for you, she will make sure you are cozy and comfortable in our spa-like treatment room and then metaphorically hold your hand through every step of your procedure. “My goal is to provide my patients with a comfortable experience and effective treatments based in science. For comfort, this means I’m thinking about those little delights like the snuggly blanket and the essential oil diffuser. And for results, it means that 100% of the treatments I perform are customized and tailored to the patient,” explains Kayla. “I love being able to bring my patients confidence by providing them with visible improvements in their skin!” Her favorite thing about being our laser provider is hearing her patients say "I should've done this years ago!" 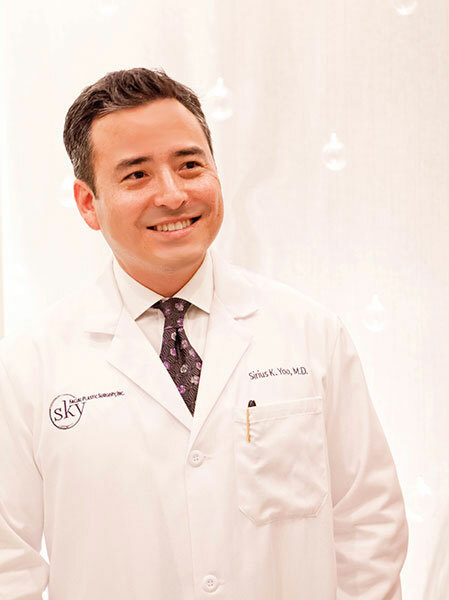 Because of Kayla’s deep medical knowledge as an aesthetic Registered Nurse, Dr. Yoo has also enlisted Kayla’s expertise in assisting his surgical and injectable patients with home care questions. “I really enjoy helping patients through their healing process post-procedure,” states Kayla. “I knew from the time I was in 8th grade that I wanted to be a leading expert in the aesthetic industry, doing something related to skincare, and so I did everything in my power to get there,” shares Kayla. She tailored her education to fulfill this lifelong aspiration by earning not one but two Bachelors followed by her Masters! Kayla has a Bachelor of Arts in Biological Sciences from University of California Santa Barbara (UCSB) as well as a Bachelor of Science in Nursing and a Master of Science in Nursing from California State University (CSU). While in nursing school, Kayla was inducted into the Sigma Theta Tau Nursing Honor Society. Kayla’s husband was from San Diego and so after nursing school, the pair decided to settle down permanently in our sunny city and they’ve never looked back. “We love it here. It was one of the best decisions,” says Kayla who has since purchased a home and is raising an adorable son. Since beginning her career as a Registered Nurse in 2013, Kayla has specialized in IPL & laser treatments for the face and neck, performing thousands of rejuvenating procedures such as Laser Genesis, Vein Therapy, Laser Hair Reduction and Limelight IPLs. When Kayla is not busy at SKY, she loves to spend her time with her family, explore San Diego, and she is a big fan of hot yoga! Kayla volunteered in her small hometown’s urgent care center which was very busy since the closest hospital was over 40 minutes away! Today, Kayla continues to volunteer with Giving Children Hope, a community service program that does everything from helping the local homeless population to international disaster relief and Hurrt Family Mobile Health Clinic, a health clinic that serves patients without insurance for free. Maddy is the cheerful voice you hear when you call SKY. Not only is she is the lead on answering our phone line, but she also manages our busy clinic schedule. Maddy is passionate about showing our patients the genuine care and compassion we have for them every step of the way, including the first call they ever make to us! “Having a positive impact on a patient’s experience is what is most rewarding to me,” confirms Maddy. Maddy graduated from California State University Northridge in May of 2017 with a Bachelor’s in Cinema and Television Arts. While in school she worked as a script supervisor and editor. Why did Maddy choose to join the SKY Team after college? “I found that what I loved most about my work in college wasn’t necessarily about the film industry itself, but about working alongside a group of passionate people who were invested in achieving the same creative vision. I feel that I absolutely have that here at SKY,” explains Maddy. Needless to say, we are so happy to have Maddy on our team! As an alumna of Sigma Omega Nu Latina Interest Sorority, Maddy participates in community service for United Friends of the Children. One of her favorite events is taking high school students on college tours. “It is such a rewarding experience being able to create an impact on these young students by helping them explore higher education,” shares Maddy. Alexis coordinates every surgery, from scheduling the surgical team to preparing for the pre-op appointment. Alexis is also one of our Patient Care Coordinators, acting as a personal advisor for patients who are considering surgery by helping ensure they understand what is involved in the surgical process and discussing all the factors that need to be considered. With her extensive background in nursing (she is a Licensed Vocational Nurse and has a bachelor’s in nursing) she is a wealth of knowledge and always a phone call away to answer any questions. Alexis is also bilingual in Tagalog and happy to assist any of our Tagalog-speaking patients. Alexis grew up in the Philippines, where she graduated from Doña Remedios Trinidad Romualdez Medical Foundation with a Bachelor's of Science in Nursing. After college, she developed and honed her customer service skills while working in the hospitality industry. She came to California to be closer to family and start a new career path. The Patient Care Coordinator position was the perfect fit for her because she has a passion for the aesthetic industry and hands-on management work. Alexis enjoys being outdoors, hiking, and traveling with her husband. She likes off-roading and surfing. Fun fact: when Alexis first moved to San Diego, she was a certified fitness instructor for Barre3! Alexis supports relief efforts for women, children and the underprivileged in the Philippines. She volunteered as a registered nurse to the non-profit organization Samaritan’s Purse International Relief during their disaster missions (post Haiyan catastrophe). Whenever possible, she continues to extend logistic and medical support for humanitarian missions in the Philippines. Rickie helps keep our surgery center running smoothly! She is in charge of sterilizing the surgical instruments, maintaining the surgical equipment, setting up for surgical cases and keeping the operating room pristine and fully stocked. During surgery, she scrubs in with Dr. Yoo in order to hand him instruments and help maintain the sterile field. If you don’t have the pleasure of meeting Rickie the morning of your surgery, you are bound to see her at your first post-op appointment, where she assists both you and Dr. Yoo during your visit. “My goal is to create an experience for every patient that is full of positivity and hospitality as they go through their surgery process,” shares Rickie. “Ever since I can remember, I’ve had a passion for maintaining close relationships with people and giving them the best service they could ask for,” says Rickie. She felt she could make the biggest impact by applying this passion to the field of medicine. After completing the required certification to become a medical assistant, Rickie spent the next eight years providing care to patients in medical centers and hospitals in Northern California. Her work in the medical field led to deep interest in physical wellbeing that eventually led her to dive into the world of strength training. In 2015, she relocated to Indonesia to open up her own gym, which is now sponsored by Under Armor! In 2018, Rickie moved to San Diego to be closer to her twin sister. She immediately joined the SKY Team as our Clinic Assistant before being hand selected and trained by Dr. Yoo to assist him in surgeries. When Rickie is not in the operating room, she is an Assistant Coach for strength and conditioning, helping locals achieve their fitness goals! Camille is our team cheerleader and coach. She started out as our Receptionist and has become an integral part of our management team. She also continues to assist patients during their consultations with Dr. Yoo. "I love working with people from all walks of life," shares Camille. "Even being able to bring a smile to someone’s face is something that I cherish." Camille graduated from the University of California Santa Barbara (UCSB) in 2016 with a Bachelor's in Communication and a minor in Sociocultural Linguistics. While in college, Camille worked as an assistant manager for Ulta Beauty where her favorite part of the job was "seeing guests transform into self-confident, self-loving individuals." That passion for helping others feel inspired and beautiful has turned into a career. "Finding a home here at SKY is the perfect way for me to apply my degree and also fulfill my desire to provide top-notch personalized service to every patient and teammate," states Camille. During her time at UCSB, Camille volunteered for the Isla Vista Youth Project as an elementary school tutor working one-on-one with under privileged youth. She is also an alumna of Sigma Omega Nu, a Latina Interest sorority dedicated to spreading awareness of ethnic diversity and well being among young women. Ashaya is key to making sure patient visits run smoothly starting with the very first phone call. Not only is she in charge of our busy clinic schedule, but she also helps answer patient inquiries and assist Dr. Yoo during patient visits. "I absolutely love focusing on our patients, from the phone calls to the office visits," says Ashaya. "I love delivering the 'SKY Experience'!" In 2009, Ashaya traveled overseas on a volunteer mission to both Australia and Indonesia. Sam began at SKY as our Receptionist and now assists behind the scenes with everything from ordering medical supplies to maintaining our accreditation documentation. "Working at SKY is a dream job because it allows me to make a difference in someone's life and truly create lasting connections and trust,” shares Sam. "The environment I contribute to reassures patients they came to the right place. I want every patient to feel like they are a part of our SKY Family.” Sam is also bilingual in Spanish and happy to assist any of our Spanish-speaking patients. Before working at SKY, Sam was the receptionist for Lincoln College of Technology in Colorado. She also worked for multiple years as a representative for Kaiser Health Insurance. Her love for the ocean and family brought her back home to sunny San Diego. She has always had a passion for the medical field and making a difference peoples’ lives. One day she hopes to complete her degree and pursue a doctorate in Neurology. In the meantime, she is enjoying creating a positive impact in the San Diego community both at SKY and through volunteer service. Sam is an alumna of Lambda Theta Nu Latina Interest Sorority, serving as the Community Service Chair for three years. Her lifelong dream is to go to third world countries and truly make a difference. She has worked with the Salvation Army, the Ronald McDonald House, Denver Homeless Shelter, and Susan G. Komen Race for the Cure. Her favorite volunteer trip was when she went to Guatemala to work in a school created by noble prize winner Rigoberta Menchu. Vice President - Amber N. Yoo, M.B.A.
With an MBA from the University of Florida (she graduated top of her class), Amber’s the brains-behind-the-scenes when it comes to ensuring the Yoo family practice runs smoothly—overseeing the marketing, finances, strategic development and all aspects of "running a business." Amber attended the University of Florida on a Bright Futures scholarship. She graduated with a degree in Business Administration and an outside area of specialization in Physics. During her tenure, Amber was a University Scholar and did genomic research on Mycoplasma alligatoris for the College of Veterinary Medicine. She went on to complete a Masters in Business Administration and graduated Beta Gamma Sigma (highest honors) at the top of her class. "I'm thankful to be able to draw on my background to handle the business aspects of our growing practice," says Amber. "We have an amazing team and wonderful patients." In 2014, 2015, 2016, 2017 and 2018 Amber was named a finalist for the San Diego Business Journal's Women Who Mean Business award. She was also selected as a finalist for San Diego Magazine's Woman of the Year award for 2015, 2016 and 2018! 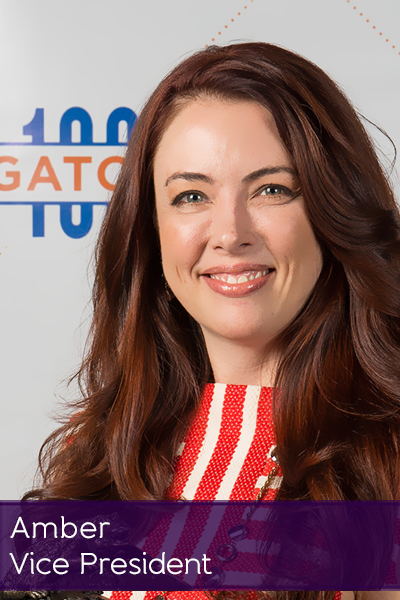 In 2017 and again in 2018 and 2019, she was honored by the University of Florida (UF) as an alumnus leading one of the top 100 fastest growing "Gator" companies. "Giving back to the community is a huge part of who we are at SKY," says Amber. This in large part is due to Amber's professional background in the nonprofit world. She's worked for Ryther Child Center, Seattle Humane Society, Humane Society Silicon Valley, and Privacy Rights Clearinghouse. In 2011, she was co-founder for an animal welfare nonprofit in LA called Friends of LA Animal Shelters. She is a lifelong member of The Country Friends. She is also heavily involved in the Rady Children's Hospital Auxiliary. In 2016, she co-chaired the 55th annual Heard it Through the Grapevine fundraiser for the Del Mar Auxiliary Unit for the Rady Children's Hospital. She served for three years as the Director of Technology on the Auxiliary Board of Directors. And she currently serves on the Executive Committee as Secretary for the Del Mar Unit. She is also a proud member of United Way's Women Leadership Council, having served on the steering committee for several years.